Bits & Scraps Of My Life: ABC.....it's as easy as 123!!! Week 31 at Scrap It With A Song! ABC.....it's as easy as 123!!! 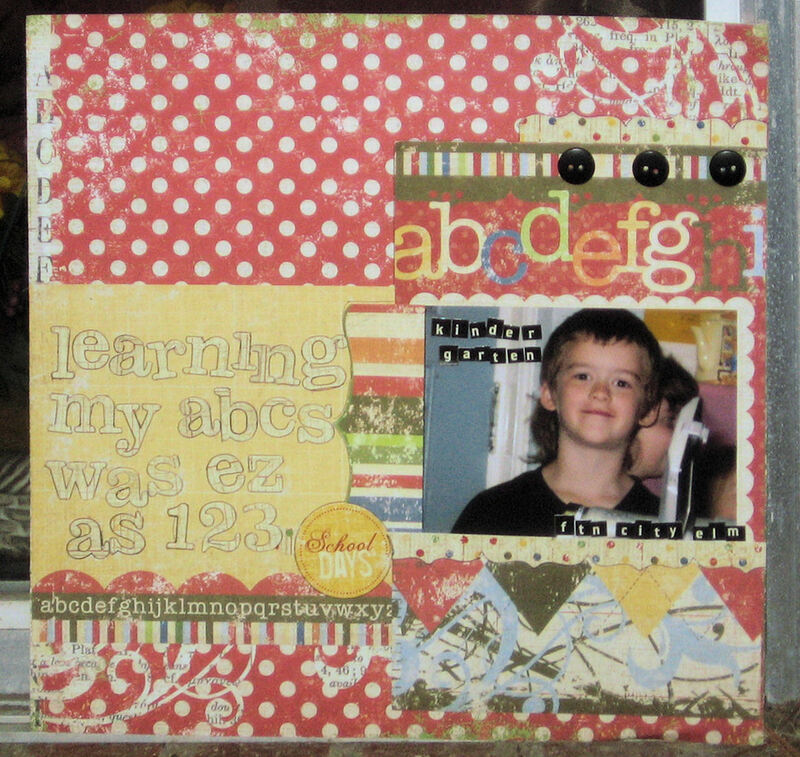 Week 31 at Scrap It With A Song! Putting that annoying song in your head.......lol. I dealt with it ALL day yesterday. Humming it, singing it.....seriously...the boys wanted me dead by bedtime. The feelin was mutual but that's another blog post entirely......lol. So are ya ready for a new song and new inspiration this week at Scrap It With A Song? BTW......I LOVEDDDDDDDD the entries for last week!! I'm sure I missed a couple. but the ones I seen.....ADORABLE!!!! Be sure to head over and see if you are the winner this week or or one of the Top five!! And head over and leave some blog luvin for those who are.....they deserve it!!! Ok, as tho you couldn't tell, this week we are traveling back in time with an OLDIEEEEE!!! The Jackson Five and ABC! And I deserve brownie points for this one because I am refraining from all of the bad Micheal Jackson jokes I know.......GO ME!! LOL...I'd better hurry this post up before one slips out and falls on my keyboard....by accident you know :) Hey, it happens!!!! 123, Do re mi, baby, huh! A lyrical masterpiece......LOL. Ohhhh goodness :) Well, this is gonna be FUN!! So, show us whatcha got.....you have til Sunday Nov 21 to upload your project to the Scrap It With A Song Blog. And I preach this every single week......and this week I am gonna have to follow my own advice...lol. If you gotta stretch the boundaries of the song to get to your creative place that is totally OK! Just explain your reasoning......LOL. Sometimes things pop into your head that may not pop ito mine.....not enough room with all of those voices I have dwelling in there I guess (shrugs) So this is one of those weeks when I had to STRETCHHHHHHHHHHHHHHH!! Kinda, after I got the song outta my head, which was no easy feat BTW......I said to my self, "Self, what do I think of when I think of ABC?" School!!! So here is a school page of Jesse in Kindergarten last year :) My title is a little hard to read since the lettering is almost the same color and the paper it's on.....which is why I outlined it in gel pen. In real life it really pops. In the photo, not so much. And a quick story......I took this photo outside last night at about 8pm......with the DST it is really dark by then now. Plus I was lazy and didn't want to walk around to the patio and deal with setting up.....so I stuck this on the ledge of my window sill outside and snapped soem pix and my neighbor was outside doing something or other.....saw the flash go off on my camera and stood there with the most bumfuzzled look ever on his face while he was trying to figure out why I was in the dark, in 40 degree temps in my shorts and a tshirt, taking pix 2 feet from my window......poor guy! I tell ya, I am so misunderstood!!! So here is my page....sorry for the digression but you all KNOW how I am!!! LOVE IT!!! Lots of color and layering....fun to put together! And this sucker is deceptively heavy too!!! Bob asked me if I stuck it on cardboard.....lol. The kit I used is one I was fortunate enough to win a few months ago......I have used all but one sheet of this kit!! So yeah I highly recommend it! It's called "It's Elementary" by Memory Works. I also used a sketch (not that you can tell) freom one of our awesome DT gals, the extremely talented Liz Chidester!!! And....just for grins and giggles I am also entering this into the Scraproom's challenge #45 for this week, which is to use patterned paper rather than cardstock for the background.....easy as (dare I say it????) ABC.....it's as easy as 123!!!!! Ahem......sorry :) Not one single piece of solid anything on this page......LOL. So cute!!!!! Great job!! Love your take on the sketch too!!!!! So cute! I'm glad you were able to combine them all! I know, the day I worked on my LO I had that song in my head for a while!